Earlier this week, I blogged about an unsolved cryptogram from the First World War. Codebreaking experts, such as George Lasry and Thomas Bosbach, have meanwhile confirmed that the message I introduced is probably encrypted with the Playfair cipher. However, the ciphertext is quite short, which makes it difficult to find the key. We’ll see, if one of my readers can break this message anyway. 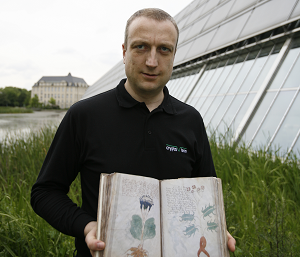 Blog reader masso spora has now informed me about another crypto mystery. This one apparently stems from the Second World War. It was published in the Reddit group /r/codes. Readers of this blog know that this Reddit group is a source I have used many times before. To my regret, the letter groups on the sheet are hard to read because the paper is wrinkled. 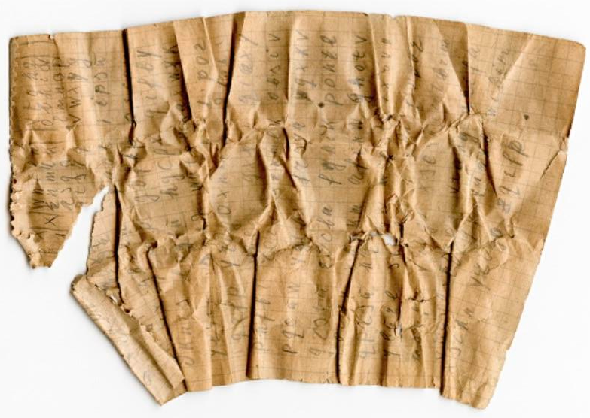 Both the sheet from France and this Enigma message contain only lower-case letters, and the characters are easily distinguishable. German army radio operators in the Second World War were trained to write down in-coming and out-going messages this way in order to avoid reading errors. However, unlike all hand-written Enigma messages I know, the Reddit text is not noted on a form. 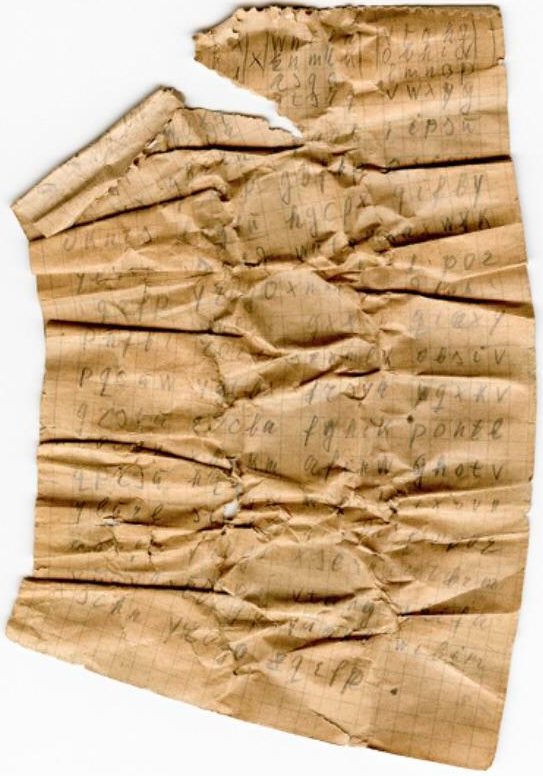 As a large part of France was occupied by the Germans in WW2, it would not be unusual that a German military cipher message was left behind there. However, this sheet was found in a US bag. Finding US military items from WW2 in France is far from uncommon, as US troups landed in northern France on D-Day before they proceeded to Germany. Perhaps, a reader knows, whether this writing style was typical German or whether US cipher clerks wrote in a similar way. If this letter sequence is a cipher message, we still need to know which encryption method was used. Of course, the Enigma (German) and the SIGABA (US) are possible, but there were many other manual and machine ciphers in use, as well. And then, there is the question if these letter groups represent a cipher message at all. One of the Reddit commenters suggests that this text might be a One Time Pad (OTP) key (i.e., a random sequence that is meant to be added to a plaintext). Many OTP key examples are shown on Dirk Rijmenants’ website. However, in my view, the OTP key hypothesis is most likely wrong. The OTP was not yet in widespread use in WW2. In addition, I have never seen an OTP key written by hand – it is easier to create a random sequence with a typewriter or some printing device. If a reader can say more about this crypto mystery, please leave a comment. Ich denke, es sind nicht die Buchstaben, die beachtet werden sollen, sondern die Form des Papiers. Möglicherweise in Nachbildung einer Landkarte oder einer Felsformation ?? Don’t the five-letter groups indicate a German Army message (http://cryptocellar.org/Flossenbuerg/Nr122.html), whereas the “Schlüsselzettel” in your image contains a Navy message (four-letter groups)? The 4×5 rectangles in the upper part seem not to be part of a message, for in the right upper corner at least two lines contain letters in alphabetical order: lmnop, vwxyz. The last to lines of the left rectangle semm to contain the missing letters of the second half of the alphabet (qrstu), even not in alphabetical order. I wonder what these rectangles might have to do with the message, if it was encrypted with an Enigma at all. During WWII the German Army also made use of hand cipher systems. For example the “Heftschlüsselverfahren” prior to another substitution hand cipher, the two-square cipher (“Doppelkastenschlüssel”). Apparently, the 4×5 matrices at the top of the sheet cannot belong to a two-square because it requires two 5×5 matrices, each without letter repetitions. The Heftschlüsselverfahren contained five-letter indicator groups (“Kenngruppen”) that indicated which bigram substitution table to use. Maybe the groups at the top of the sheet represent such indicators. This system is covered by van der Meulen, The book cipher of the Wehrmacht, Cryptologia 1995, 247-260. Who has access to the Cryptologia and can check this out? >and can check this out? The Werftschlüssel produces five-letter groups, which is consistent with the cryptogram covered here. However, there were others of this kind, as well. The “Werftschlüssel” was a marine cipher, whereas the “Heftschlüssel” was an army cipher. Since I don’t know the article on the “Heftschlüssel” – were they based on the same system? I have the paper. Email me at doranchak@gmail.com. I don’t know the “Heftschlüssel”. In van der Meulen’s paper only the Werftschlüssel is mentioned. Is there a source for it? The source is van der Meulen’s article cited in post # 4, you are referring to another article by van der Meulen. In the article the system is called “book cipher of the Wehrmacht”, the (original) German term “Heftschlüssel” is mentioned in a footnote. The underlying document is a Heeresdienstvorschrift (army service rule) from 1939, https://www.deutsche-digitale-bibliothek.de//item/LF5XME2PYEZKKYSZE4IOU2O34ZK7OATB. This system made use of five-letter indicator groups. It was only a guess from me that the groups in the 4×5 matrices at the top of the sheet form indicator groups, since they apparently don’t belong to the ciphertext of the message. 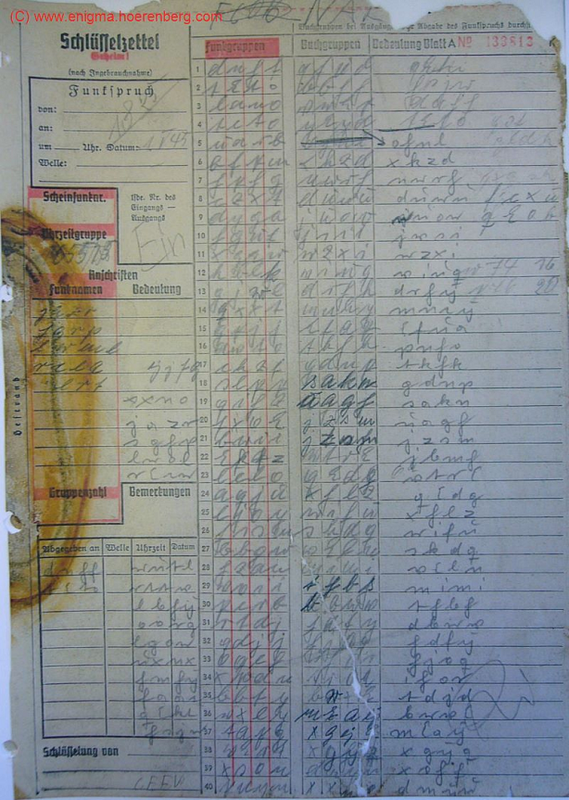 But I must admit that the “Heftschlüsselverfahren” made use of special form sheets for enciphering and deciphering. >you are referring to another article by van der Meulen. You are right, sorry. I will check this article.